Nothing says "welcome home" like a sick kid! Last night I was away for our team meeting in Springfield and this morning was supposed to be my catch-up morning, but 10 minutes into the school day, Elise was throwing up! She seems okay, so I'm keeping my fingers crossed it was a "one and done" kind of bug and that no one else gets it. Am I delusional!? 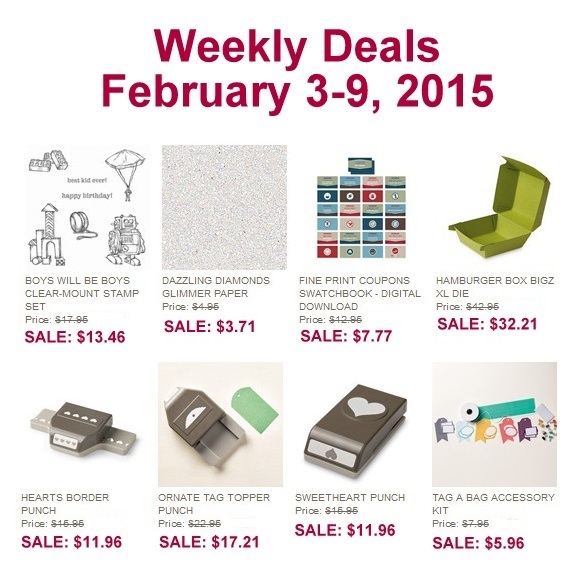 Check out the latest Weekly Deals from Stampin' Up! There are some great punches for last minute Valentine's Day crafts! Even the brand new Ornate Tag Topper Punch is on sale!! She added some White Note Cards and Envelopes and made some simple notecards like the one above and this one. And the leftover heart punch outs were perfect for adorning the envelopes or more valentine treats!